(a) Using a snap ring expander, remove the snap ring. 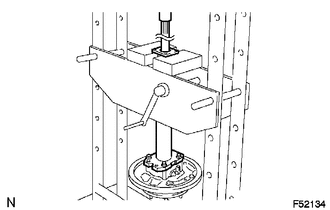 (a) Using SST and press, remove the rear axle shaft. 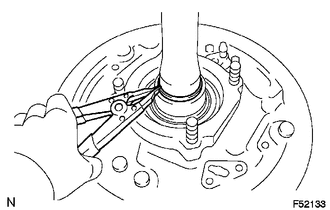 (a) Remove the rear axle bearing retainer inner from the rear axle bearing. 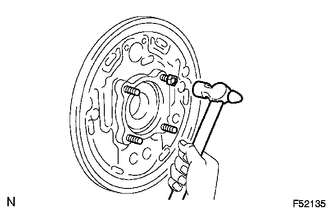 (a) Remove the rear axle shaft washer from the rear axle bearing. 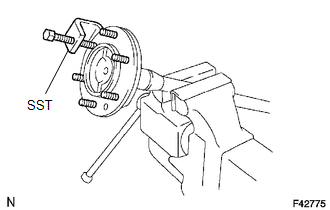 (a) Attach the 4 nuts to the rear axle housing bolts. (b) Using a hammer, remove the 4 rear axle housing bolts and rear axle bearing. Do not reuse the nuts previously removed from the vehicle. (a) Using SST, remove the 6 hub bolts. 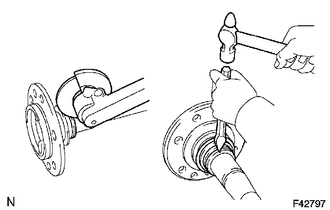 (b) Remove the deflector and deflector gasket from the rear axle shaft. (a) Grind the rear axle bearing inner race surface using a grinder, and then chisel them out with a chisel. (b) Remove the rear axle shaft oil seal from the rear axle shaft.